When I do a Google search for “Alberto Bustamante,” several lawyers and business people are returned to my screen, perhaps the antithesis to the Alberto I am looking for, the founder of a monthly performance queer party in Mexico City called Traición, and the creative director of N.A.A.F.I., an independent record label that puts out electronic club music. When I search for “Mexican Jihad,” though—Bustamante’s DJ name and internet alter ego—articles from The Fader, LA Times, and Vice appear, touting him and his many projects as the future of club culture in CDMX and beyond. Originally from Oaxaca, Bustamante moved to Mexico City for architecture school, yet another job on his current wide-ranging resume. He’s since become a fixture of the city’s queer community, the driving force behind much of Mexico’s current culture. When he’s not in CDMX for his various roles, he’s often traveling for DJ gigs, using Berlin as a home base to tour around Europe during the summer, and frequently playing in Los Angeles. Here, he shares how Traición got started, his favorite spots in Mexico City, what’s in his DJ kit, and what he never travels without. Bustamante at his home in the Juarez neighborhood of Mexico City. Bustamante and his partner at home. Tell us about Traición, the monthly queer performance party that you helped start in 2015. Traición started three years ago. The main partners are all in way cultural promoters and programmers, and we were all working in different festival infrastructures. The partners are Pepe Romero, who takes care of the performance programming, Derré Tida, who mostly represents female artist in Latin America, and Diego Jiménez, who programs some of the biggest festivals in the city. We realized we didn’t really have a space for ourselves—even though we were programming all this stuff around the city, we weren’t really working on anything that catered to the queer audience. In the beginning, Traición was more of an afternoon thing—something that started at 4 p.m. on Sundays, because Sunday is still the most traditional day of the week for Mexicans and we wanted to create a family gathering. It has evolved a little bit. Now we also do proper weekend parties and raves, stuff at warehouses. But the original format is cozy and small, usually in cocktail bars. How did your DJ alter ego, Mexican Jihad, get started? 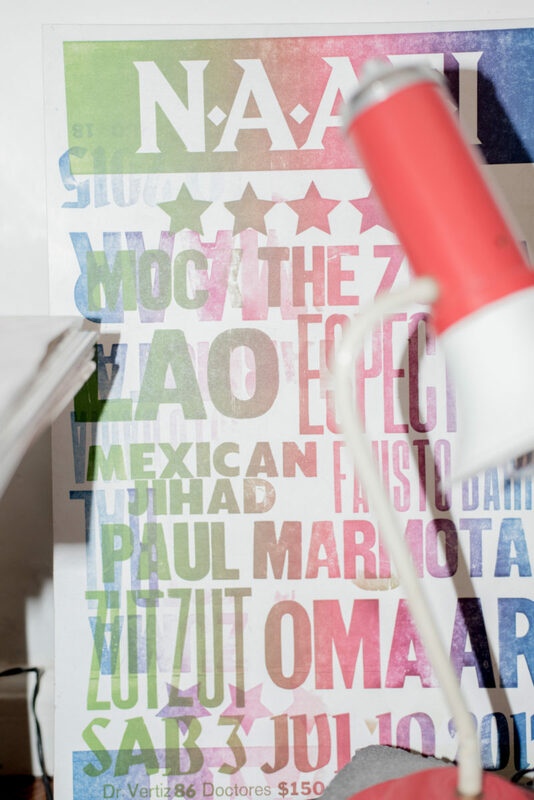 Mexican Jihad started out as a visual project, a website that provided a commentary or a media critique on the way the war on drugs was being pictured. Then it became my DJ name. Mexican Jihad has given me the opportunity to travel to a lot of different places, to play at parties, queer gatherings. It’s been very rewarding. Even though I don’t produce music myself, Mexican Jihad has really allowed me to develop different aspects of my personality or identity. 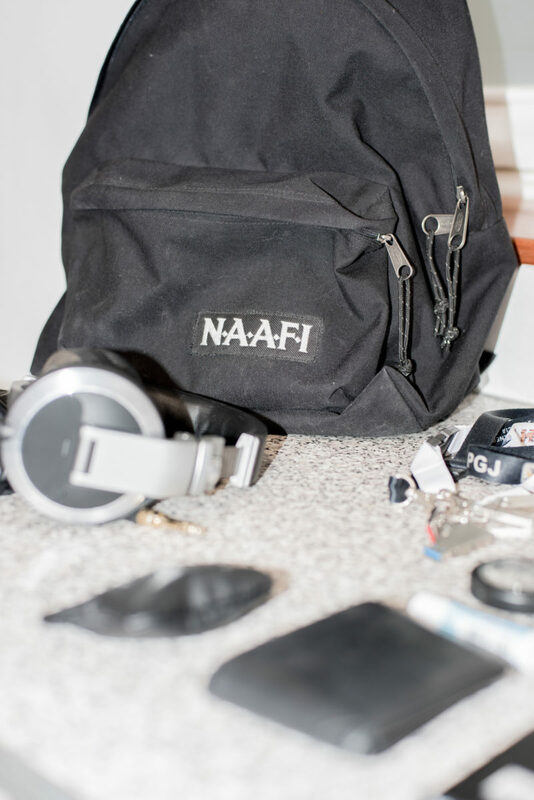 A poster for Bustamante's independent record label, N.A.A.F.I., at his home. What is your general packing philosophy? The last trips I’ve done have been DJ trips, so [what I’m packing] really needs to be very versatile. You kind of live during the night in every city, so you have to be prepared for the cold weather, and also think about the club outfits, which are usually sports wear or very light clothing. I usually pack stuff that could work for the club and also for run at a park or something like that. I always carry one pair of swimming trunks with me, in case I get the chance to swim. I try to not eat anything on the plane, just drink a lot of water, and try to avoid airplane food in general because it kind of upsets your stomach. What do you like to wear when you’re DJing? You get your picture taken a lot when you DJ so I like to wear my designer friends. My favorites are Victor Barragan, he runs the label Barragan from New York City, and I also really like Barbara Sanchez-Kane. She’s currently running her brand Sanchez-Kane here in Mexico City but she’s originally from Medellin. Those two designers I would say are my favorite at the moment. They’re both queer and they deal in conversations that interest me a lot, about performativity, gender, and sexuality. Both of the brands are very playful in that identity realm. What are some things you never travel without? These eye drops that I always carry with me, they’re a Japanese brand called FX Mio, I became hooked on those when I was in architecture school. We would spend entire nights working and then in the morning you would have to present. These are like Red Bull for your eyes—they really freshen up your eyes and it takes away the tired red look. They’re kind of strong and they really hurt the first time you use them. Every time I go to Japan or when friends or DJs visit from Asia, I always ask them to bring me some. Inside Bustamante's DJ kit: a leather wallet with the Mexico City logo, Sennheiser ear buds, and standard DJ headphones by Pioneers. 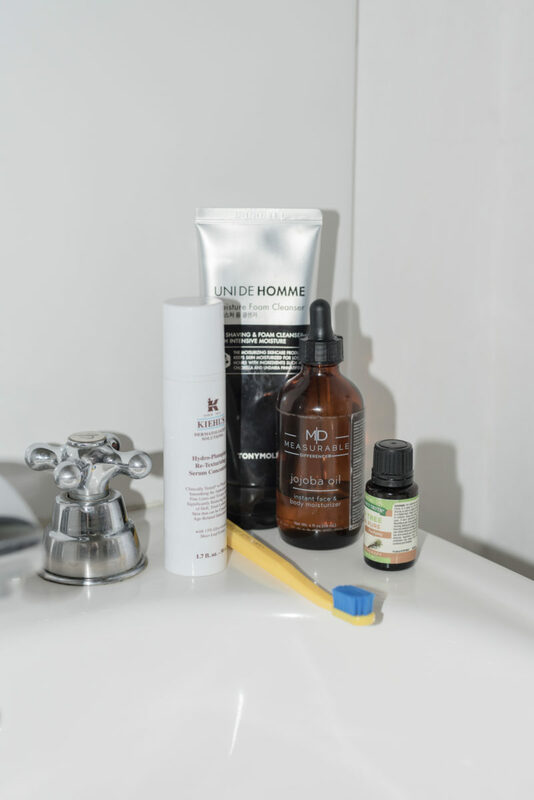 Dopp Kit essentials: Uni De Homme foam cleanser, Kiehl's eye plumping serum, essential tea tree oil, jojoba oil, and a toothbrush from Curaprox. "This belt was a gift from a friend. It’s very exaggerated and opulent. It feels very very Mexican Jihad, very Marco." Tell us about what’s in your DJ kit? My ear buds by Sennheiser, I love that brand. In the industry they call them “monitoring headphones”—they’re what sound technicians and sound engineers use when there’s a performance to monitor each of the instruments. It’s probably twice the volume that all of the regulated headphones in the market carry. So they’re really good to listen to electronic music. The bigger ones are DJ headphones, they are actually standard Pioneers. I got them in an emergency when I was playing in Bogota, and they lost my headphones so I had to buy those. Those are not that glamorous. I wash my face with Uni De Homme foam cleanser. And then I use an eye plumping serum by Kiehl’s. I always pack essential tea tree oil, and I use that pretty much for everything—for my armpits, for my scalp after I shower. I also use Jojoba Oil for everything. I use a toothbrush from Curaprox, because I like the colors. What do you carry on the plane with you? I take everything that’s super essential to the trip with me on board. That typically includes my DJ stuff, a couple of books—one fiction, one nonfiction, in case I get bored with one—my headphones. I used to be really against all that travel aid equipment like the neck pillow and the eye mask but now I use them. 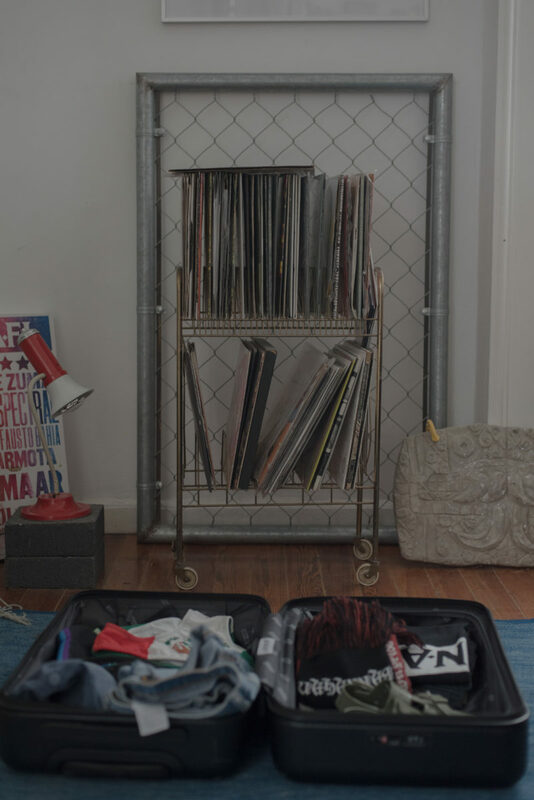 I have a couple of go-to records that I listen to while traveling, usually ambient music. I have this specific mixtape that I love, it’s called Music Interiors. That’s great for traveling. I try to drink a lot of water during the flight, because that’s really what gets me about airplanes is that you feel dehydrated after. I take my eyedrops, and that’s pretty much it. 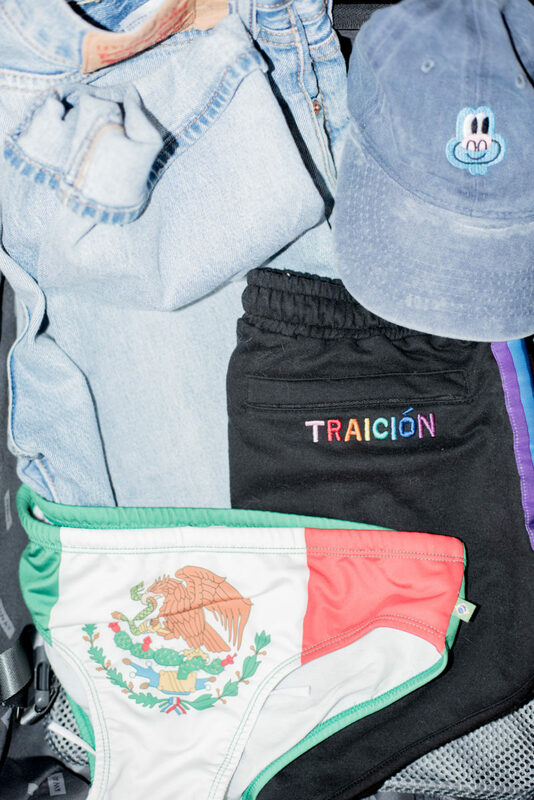 Traición shorts created for the 2018 Pride Parade; a cap from a prominent Mexican graffiti artist; swim trunks, because it's always good to be prepared. How do you get to know a new city? Traveling for DJ gigs is a very peculiar way to approach or experience cities, because you basically land in the nightlight, or party scene. So you get to see a city’s relationship to nightlife and drugs, but also sexuality and performativity in that sense. And then, when I have a couple extra days in every city I always like to check out museums and parks. I also love checking out when there’s a culture of bathhouses in each country, for example Turkey or Japan, there are a few cultures that have a very nice relationship to water spaces. What are your favorite parts of Mexico City? I really like Juarez, which is where I live. I like it because it contains Zona Rosa, which would be the gay district, and also some of my favorite restaurants, which are typically Korean barbecue spots. Zona Rosa could also be known as K-town, or the Korean neighborhood. And always Centro Historico—it’s always a must—I love it. I love the energy, and all the different layers of history that you can feel when you visit. Lately I’ve been really been enjoying Chapultepec Forest, which is the huge park in the heart of the city. It contains a lot of the museums, a lot of running trails. I guess in size it would be like three times the size of Central Park in New York, and functions for the city in a similar way. What are your favorite places to go out in Mexico City right now? My favorite queer bar at the moment is La Cañita, it’s owned by my friends and is this Lesbian ceviche place. I always go there for their micheladas, which is a mix between a Michelada and ceviche. So the ceviche sits on top and kind of drips… it sounds gross but it’s really good. And they have really cute programming with queer DJs and performers. It’s been my favorite queer bar this year. I also like this tiny small club called Juju. It’s one block from my house, it’s a tiny basement, maybe for 60 people. They have fun techno parties. If you’re visiting Mexico for a few days, it’s always nice to visit a few museums. It’s the city in the world with the largest number of museums, and some of them are very impressive like the Anthropology Museum, the Modern Art Museum, or the Museo Nacional de Arte.